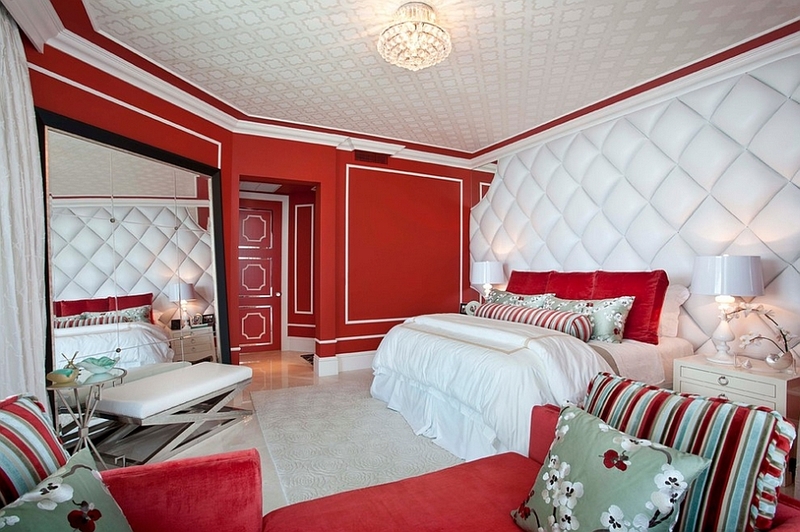 When it comes to infusing a space with vivacious energy and a touch of romance, few colors come close to red. It is a great way to showcase an architectural feature, give it prominence and elevate a space that is filled with boring neutrals. 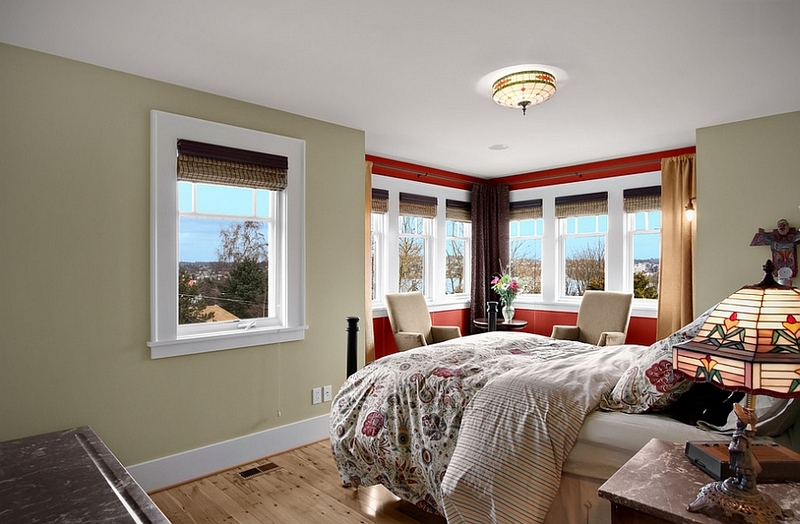 Yet when it comes to adding this brilliant color to our bedrooms, we often find ourselves hesitant, and fearful that the color will overwhelm the space. 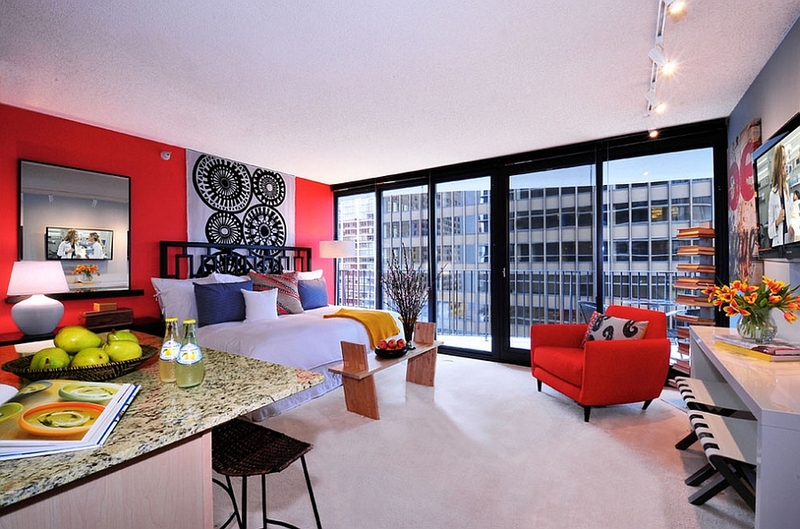 Also, many believe that red may disturb the harmony of their serene, personal sanctuary. But for those who dare, red is indeed the perfect choice! 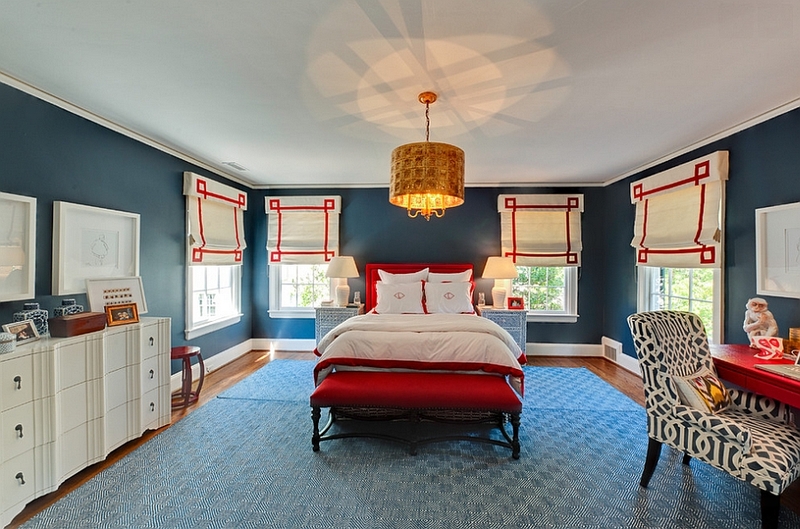 Decorating red bedrooms is all about getting the balance between the various elements in the room just right. While some prefer an overdose of this audacious color, others use it in a sporadic, elegant fashion. Much as in the case of the perfect red living room, it is all about picking the right hue and letting it become an organic part of the theme you have chosen. So, why not get started? 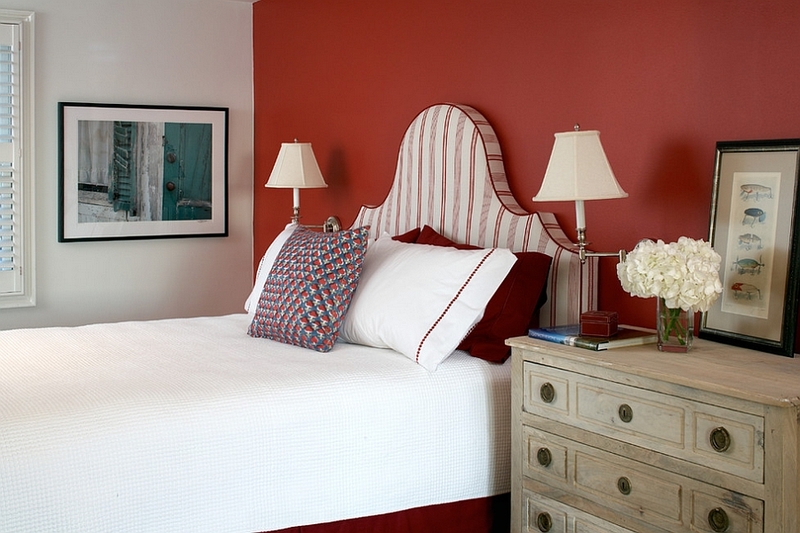 Red is a great choice for an accent wall in a bedroom where the other colors are muted and unimpressive. 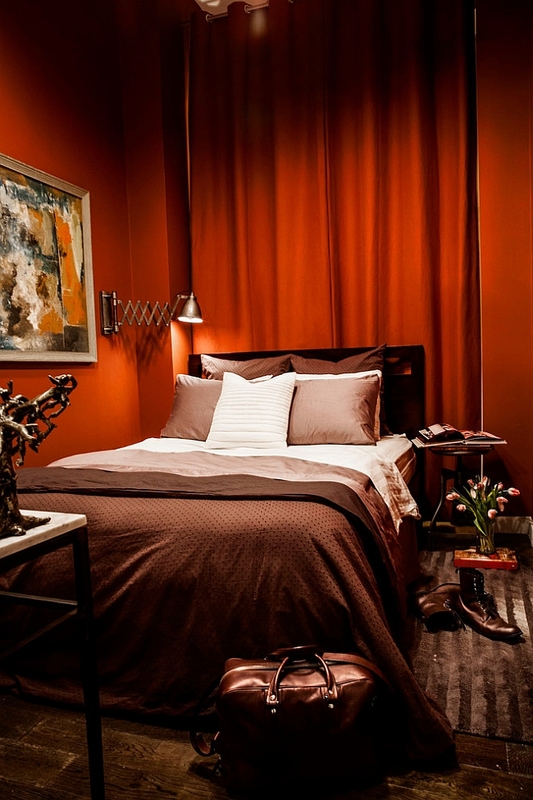 Since most homeowners are moving toward the trend of picking an all-white or gray backdrop for the bedroom, red is a wonderful way of enlivening this setting in an instant. Most often, it is the wall behind the bed that is chosen for this task. 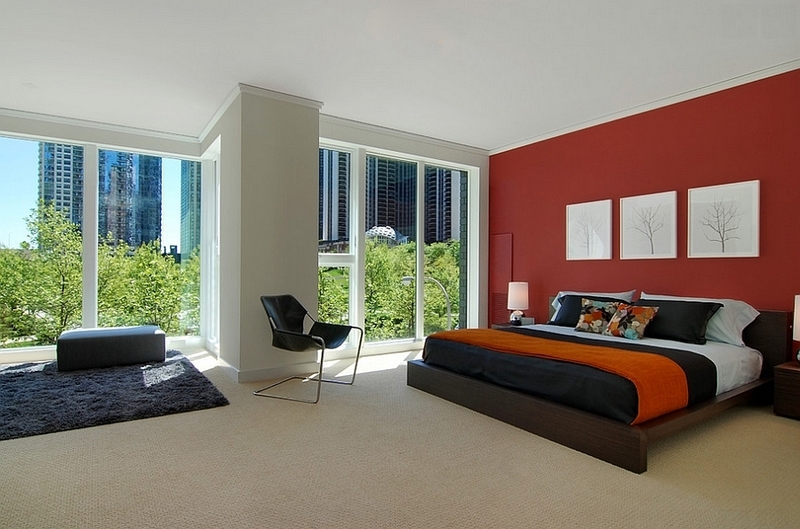 Red bedroom accent walls make an even more stark visual impact when the rest of the room is as minimal as possible. 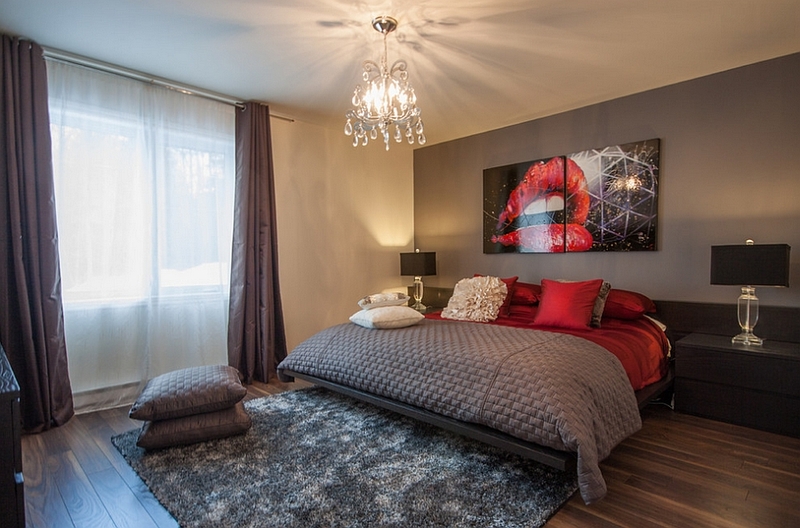 And much like in any other room of the house, a touch of black along with red brings sophistication to the bedroom instantly. 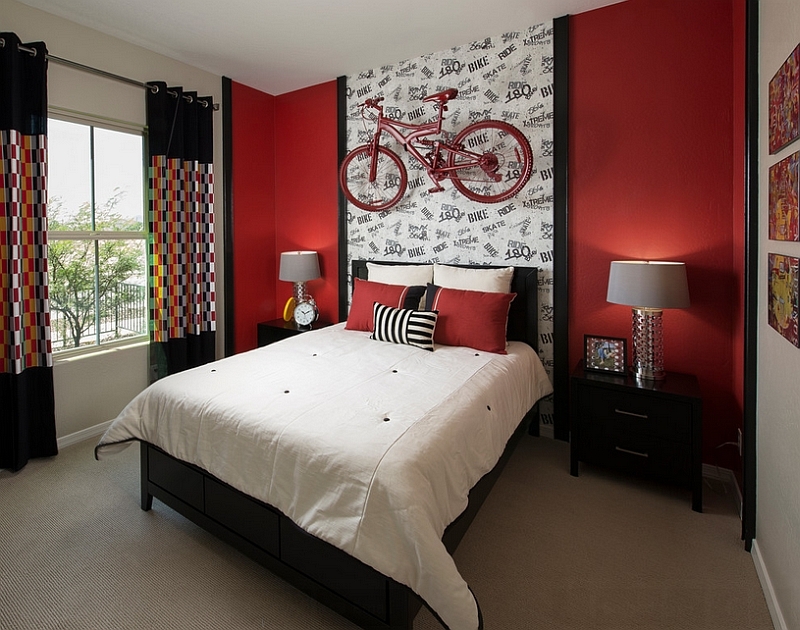 When you use a red accent wall, make sure you repeat the color elsewhere in one or two decor elements. 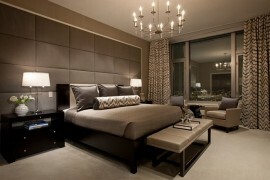 Since we are talking about bedrooms, pillow covers and duvets can also be used to get this done with ease. 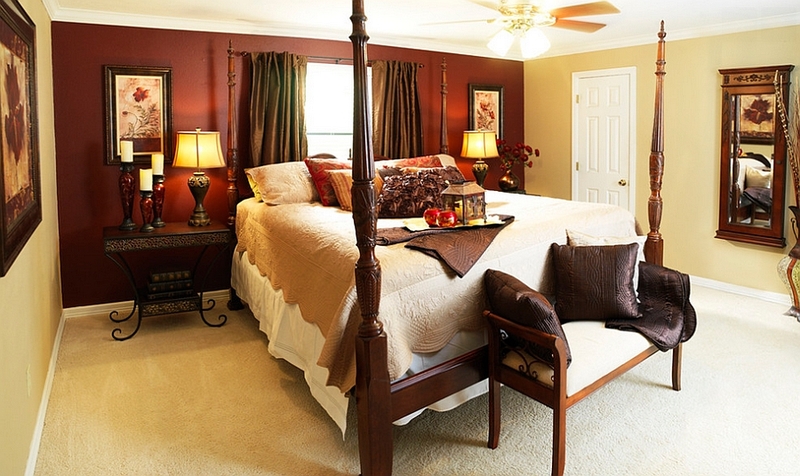 By repeating the color, one gives the bedroom a more elegant look with a touch of symmetry. Just like in the case of blue or yellow, there are many different shades of red that you can pick from. Consider the entire range before you make the final choice. 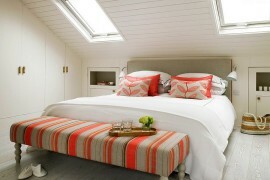 Maybe all your bedroom needs is a touch of orange-red or rich scarlet to give it the enchanting vibe that you are after! 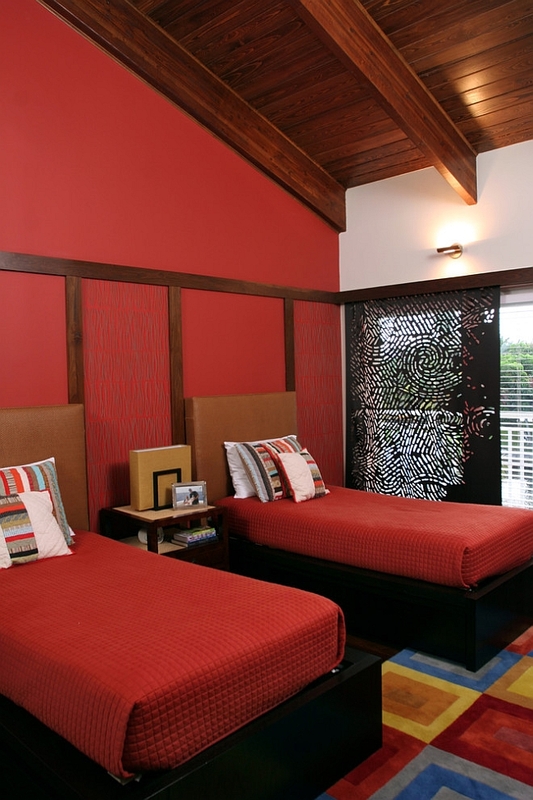 But in the case of red, it is the finish that seems to make the biggest difference in the atmosphere of the room. 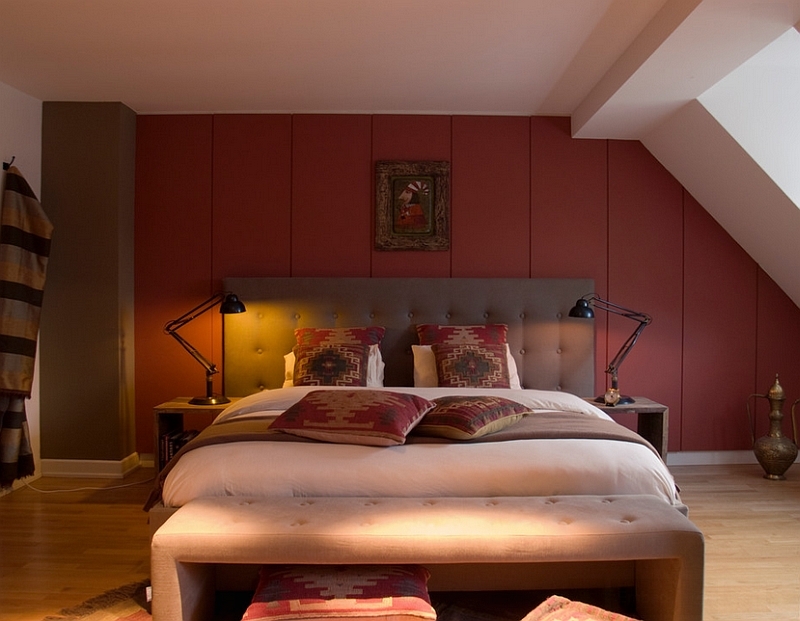 While matte finishes give the room a more understated look, glossy reds are ideal for contemporary bedrooms searching for that rich, exotic look. Shades like berry red manage to bring in a touch of purple along with red and take the decorating process in an entirely different direction! 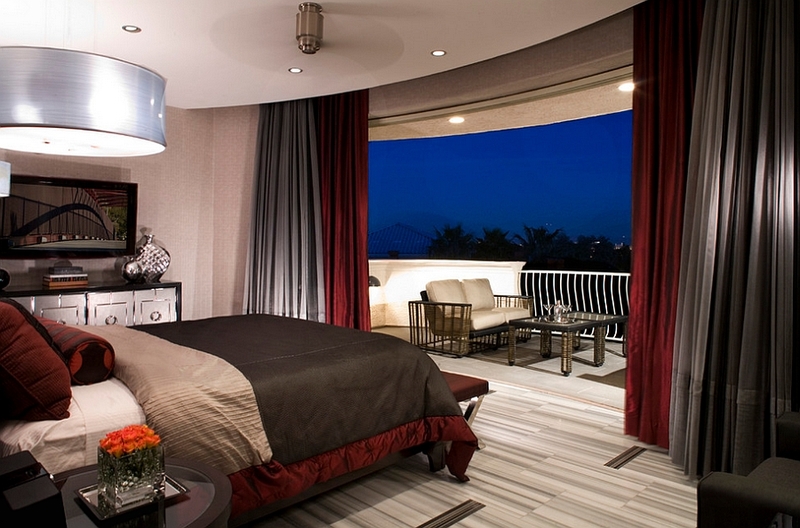 When it comes to bedrooms, drapes in velvety-red are a huge hit, and they can be used in themes ranging from modern to Mediterranean with seamless ease. Combine them with the right bedding for a posh, captivating ambiance that looks even more spectacular with the right lighting. Finally, we take the path of red accents for those who are still having color commitment issues and a fear of jumping into red. 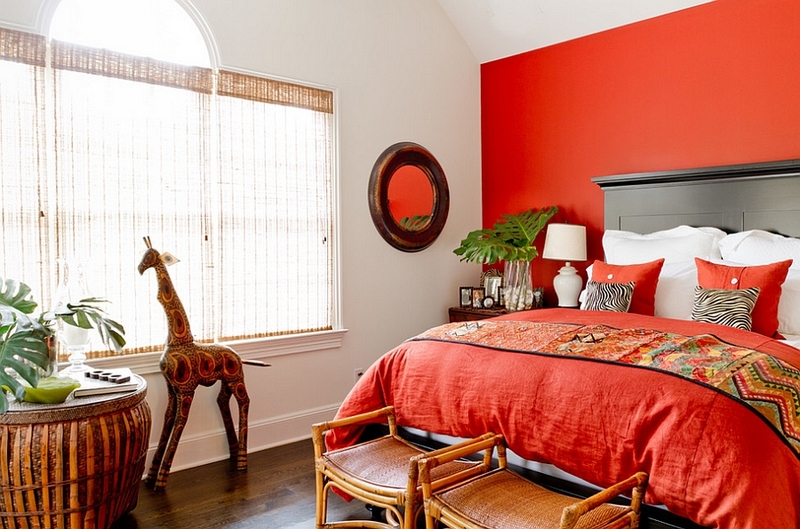 Give the daring reds a shot by using a bold rug, an accent chair, lovely bedding, pillow covers or even nightstands in the hue. If you are happy with the first few choices, then you can continue this approach by adding additional pieces over time. This is also a great way of trying new, exotic shades of red that you are not entirely sure about. But just as in the case of the accent wall, use the color in more than one place to really get the right feel for it before coming to any conclusion. Red can be used in a diverse range of settings and with multiple themes, making it a delight to work with. All you need is a bit of imagination and some restraint to pull it all together in a grand fashion. Of course, you already have all the inspiration you need. So, ready to turn to red this festive season?